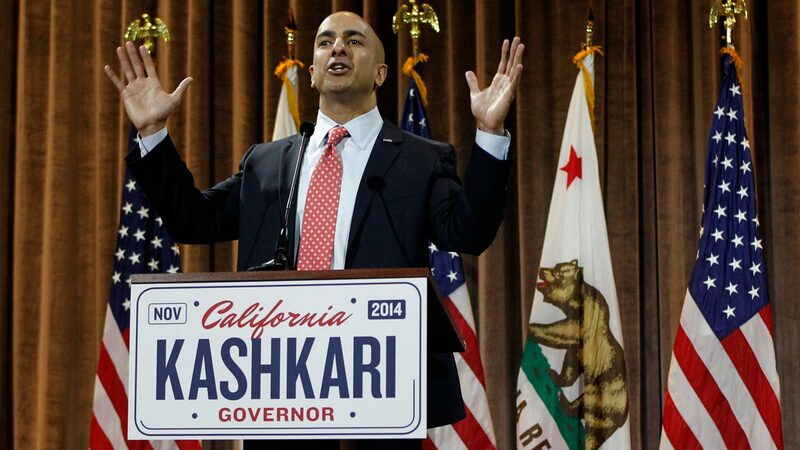 No doubt about it ... Republican Neel Kashkari is an underdog... a big underdog in the race for Governor of California. The most recent California Field Poll taken right after the June Primary Election shows Kashkari trailing Democratic Governor Jerry Brown 52% to 32% among likely voters in the election for the Governor's office. The Field Poll also finds that 54% of voters approved of Governor Brown's job performance with 29% disapproving. So, there's no way Kashkari can possibly overcome those numbers and win the race in November, right? It's been done before... but not by the challenger. 20 years ago, State Treasurer Kathleen Brown, a Democrat and sister of Jerry, wanted to be the third member of her family to win the Governorship. She challenged the Republican incumbent, Pete Wilson. In the summer of 1994, California's economy was struggling and Kathleen Brown blamed Governor Wilson for the problems. It worked... for a while. Brown surged in the polls... actually leading Wilson at one point by... wait for it... 20 points. A victory by Kathleen Brown in November looked like a sure bet. The race between Wilson and Brown eventually turned nasty and the incumbent Governor proved to be California's Comeback Kid. He "leap-frogged" Brown in the polls during the fall of 1994, and beat her soundly in the showdown in November by 15 percentage points. Wilson pounded his wedge issues in the campaign to victory. He talked tough on crime and opposed affirmative action and giving state services to illegal immigrants... leading a so-called "Republican Revolution" at the State Capitol. Many of Wilson's supporters believed undocumented aliens were breaking the state bank which only amplified the sour economy during that election year. However, Wilson only earned 25% of the Latino vote... one of the lowest numbers ever in a California Gubernatorial Election. Some political analysts trace the problems of the present-day California Republican Party back to that election that they believe... turned Latinos away from the GOP. Others think the troubles relating to illegal immigration continue to harm the Golden State. Could Neel Kashkari mount a Pete Wilson-like comeback and pull a major upset on Jerry Brown? As the challenger and newcomer to California politics, a victory by Kashkari is not likely... especially and obviously in a state where Democrats hold a big edge in voter registration. To at least mount a strong campaign, Kashkari will need to pay attention to new information from the National Association of Latino Elected and Appointed Officials. The group predicts Latinos in California will vote in record numbers for the November Election. They believe nearly 2.5 million Latinos will mark ballots in the state... that's up more that 17% from the last mid-term election in November of 2010. Its doubtful Kashkari would venture back into the same territory as Pete Wilson did twenty years ago, even though he has Wilson's endorsement. The recent Field Poll shows Latinos, African-Americans, and Asian-Americans strongly favor Governor Brown. So, Kashkari will need to attack Brown by doing more than chopping away at his "Crazy Train". Look for Kashkari to talk heavily about job creation, improving education, fixing immigration, and limited government. Those issues should appeal to conservative-leaning Latinos and most Republicans. The recent Field Poll shows Republicans like Kashkari over Brown by a five to one margin. In November, history may not be on Neel Kashkari's side, but he can certainly learn from it for this campaign and possibly the next one. I always find it laughable when bloggers and pundits attempt to paint Latinos with a broad. Conservative Latinos may have different agendas based upon whether they are urban or rural, college educated or not, skilled labor, or professional, or unskilled. There are so many factors that contribute to a person's place on the political spectrum that to say Kashkari is going to have some appeal because of his sound bites is a bit short sighted.